I received the following email from Scholastic. 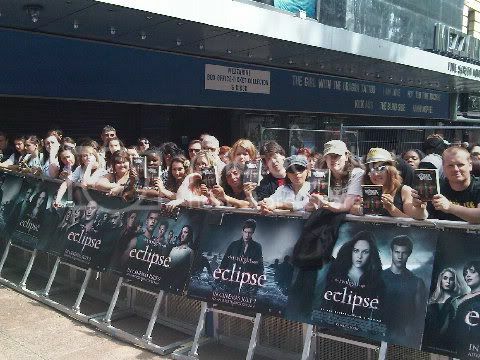 Twilight fans queuing in Leicester Square ahead of tonight’s Eclipse premiere have been passing the time by reading Suzanne Collins’ phenomenal book The Hunger Games. 3,000 copies of The Hunger Games have been distributed to teenagers and young adults this afternoon, who were eager to read the book recommended by Twilight author Stephenie Meyer. Meyer became a champion of The Hunger Games books after posting a rave review on her website. Further praise followed when Stephenie Meyer read book two The Hunger Games: Catching Fire. Since The Hunger Games was first published in January 2009, enthusiasm for the series has grown exponentially. Even Stephen King “couldn’t stop reading”. The final installment of the heart-stopping Hunger Games trilogy, The Hunger Games: Mockingjay, will be published in the UK, on 25th August following a worldwide embargo. The global print run for The Hunger Games Mockingjay is in excess of 1.2 million copies. It is one of the most eagerly-awaited books of the summer. I really really really need to read The Hunger Games! When I worked at a bookstore loads of the people I worked with told me to read it and we were always running out of copies. The Hunger Games is absolutely amazing. I loved it. Catching Fire too, and I can't, can't wait for Mockingjay! Rachel - I knooow! I loved it! I'm eagerly awaiting being able to read Catching Fire, I know it's going to be awesome! I'm sure Mockingjay is going to be amazing too!